Hey there group. Looking for suggestions on where to start our Winter 46 journey. Not to but some of the info we have come across is a few years old. A little info to possibly corral the responses. We are not new to ADK or High peak hiking; however, are very new to winter hiking / camping. As we are 6 hours away with limited weekends to get up, it would in fact be an overnight endeavor (We live 2 miles from the AT and will train, test, and practice what we can - albeit not at altitude). We have reached the summit of Cascade, Porter, Esther, White Face, and Giant....in Summer. Gear wise we have a Light 4 season tent, two 0 degree bags, closed foam pad, inflatable pad, a good layering system with hard shell overcoat, OR gloves with liners, multiple hats, Snow shoes, Microspikes (possibly adding 10 pt crampons), and OR Gaiters. More has been excluded from this list to keep the post somewhat less voluminous. With all that said, seeking recommendations as to the safer approach in tackling a winter 46 peak with an overnight stay to test the system. We have read and considered a non 46 to start, but that is not our style. As we did not have enough time while doing Giant to get in Rocky Ridge, we were thinking of Rocky Ridge via Roaring Brook with the overnight at the Campsite near the top of the waterfall? Should be able to get the hike in and back down while being close to the case / road is there is an issue. Welcome any thoughts on this and recommendations on other potential peaks. Thanks in advance for your insight and patience. So a couple of comments first on the feasibility of overnighting in the backcountry while working on your Winter 46: Personally, the only peak of the the entire 46 that I did as an overnight in winter was Marcy (and I eventually ended up re-climbing it in winter as a day hike on the same day that I did Grey and Skylight, because why not?). I thinks it is significantly, vastly, preponderously more efficient to work on your Winter 46 via day hikes. Winter camping is awesome and fun... and it's also a huge time sink. Everything takes two to four times as long in winter as it does in the summer- setting up camp, cooking dinner, going to the bathroom, getting ready for bed, getting up the next morning, getting dressed, cooking breakfast, breaking down camp, etc. As a day hiker with alpine starts (anywhere between 2 and 6 am), I usually found that I was hiking past overnighters in the morning while they were still in camp getting ready for the day, and often beat them to the summits by a fair margin. Granted, they had less distance to travel than I, but for multi-peak days especially, it was still clear that as a day hiker, I had the obvious advantage. I think it's fine if you're still determined to do the entire Winter 46 as overnight trips, but I would be prepared for the endeavor to end up taking you longer accordingly because you're going to end up averaging fewer summits per weekend visit, and may even end up with orphaned peaks along the way (Seward and Donaldson but no Emmons, Santanoni and Panther but no Couchsachraga, etc.). Alternatively, there are some cheap temporary accommodations available that can allow you to visit the area for a weekend while still doing day hikes only, without having to mess with the added complications of overnighting in winter. (A couple of forum members even run a nice hostel outside of Lake Placid). I'll start with addressing winter ascents in the High Peaks first, and add a separate section on winter camping below. Again, provided that it's an informed decision, you're free to combine the two, but from an educational standpoint, both are best addressed separately as each is challenging in it's own right. IMO, there's three big questions that your answers to from the outset are going to influence what the best course of action is for you from the outset. Do you have any winter experience at all? If not... my first suggestion would be to keep overnights and High Peaks ascents separate, at least for your first few forays into either activity. A winter high peaks day hike, or a winter overnight trip without a High Peaks ascent are challenging enough undertakings for beginners as it is. To combine the two without previous experience in either is a potentially dangerous endeavor. Winter camping especially is worlds apart from summer camping, and you're going to want to give yourself at least a couple of trips to gain experience without the added challenge of trying to get up a high peak. Have you taken a course in Wilderness First Aid? IMO, a WFA certification is just an all around good idea for anyone who spends any amount of time regularly in the backcountry. The skills you gain from such a course become absolutely imperative, though, for winter backcountry travel. Being able to recognize the early warning signs for frostbite and especially hypothermia is essential, as is knowing how to respond accordingly- before any cold-related injuries progress to the point that a hiker is rendered incapacitated. A WFA course usually runs 2 days (most can be completed in a single weekend), and typically costs about $150 or so (peanuts compared to how much we spend on gear overall). There's two companies that are well known for offering such courses- SOLO and WMA. Between the two, I've found WMA's courses to be consistently better in quality, but SOLO courses are decent as well. 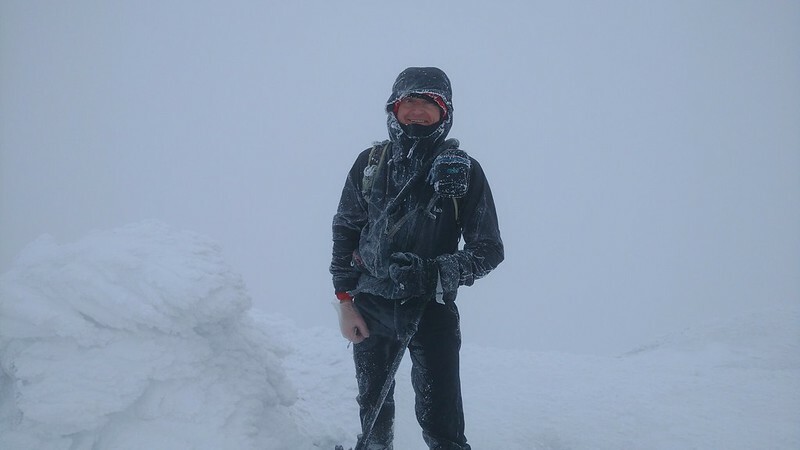 Are you competent with navigation in true, full-on white out conditions? Obviously a GPS is essential here, but so to is some measure of ability to navigate via "dead reckoning," or by map and compass alone without the aid of distant landmarks to clue you in to where you are. Every winter, at least 1 or 2 hikers end up getting turned around and lost above treeline in a whiteout, and the DEC has the send rangers up into the maelstrom to rescue them. Above treeline terrain is not something to take lightly- on a blue sky day with no wind and plenty of sunshine, it can be a beautiful, amazing experience even in winter. But when (not if) the conditions go south (and they can go south fast), it can quickly turn into one of the single most challenging (and even life threatening) experiences of your life. Keep in mind that in the winter, the summits of the High Peaks are socked in with low cloud cover on 2 out of every 3 days, and significant snow accumulation occurs at higher elevations on 1 out of every 3 days. And even without cloud cover, high winds above treeline can mean frostbite in as little as a few minutes if you've got any exposed skin. The best High Peak for a first winter ascent is one without substantial above treeline terrain that you've already climbed in non-winter conditions. Avoiding substantial above treeline terrain (such as can be found on the likes of Marcy, Algonquin, Haystack, and Skylight) means avoiding any potential for the worst possible conditions, something that is never a bad idea when you're just getting started in a new type of outdoor activity. And sticking to a peak you've already climbed means that you'll be in terrain that is somewhat familiar to you, on a trail you've already hiked with knowledge of where the junctions are and what way to go at each, with expectations that are tempered by actual, previous experience on that same specific hike. Specifically (and especially since you've already climbed it), you can't go wrong with Cascade (and Porter). Cascade is a short enough hike that bailing is easy if you realize you're well outside your element, and it's got just a touch of exposure that you can start to see what being above treeline is like without significantly putting you in danger if you're not as well prepared as you thought. As you gain experience I don't necessarily think that every peak you climb in winter needs to be one you've already ascended in summer, but when you're still just starting out with winter ascents doing this will likely substantially increase your odds of successful ascents. Clothing and gear that will get you through a night. Extra layers are imperative, even if you rarely ever use them- don't fall victim to the trap of thinking that since you never pulled out that massive down jacket on your first 5 winter hikes, you won't need it for the sixth. In the event of an injury, and especially if you're in an area without cell service where your hiking partner is forced to leave you to hike out to civilization and summon aid, it could be 8 or 10 or 12 hours before rangers get to you. And even after they've reached you, you could still be in the woods for another day or two before they're able to get you out. Carrying a full sleep system (tent, etc.) is more likely to bog you down than it is to be useful, but I think there's something to be said for also carrying at least carrying a small emergency bivy, perhaps a small tarp, and for longer trips into more remote terrain, perhaps a small (but cold-weather efficient) stove. Clothing to wear during the day that will allow you to layer. Read up on layering of clothes for cold weather hiking if you're not familiar with the concept. The general gist is that you want enough layers of clothes to stay warm, but not so much that you're soaked with sweat- which can easily lead to hypothermia in the long run (some amount of sweat is unavoidable even in winter). Multiple thin layers are often better than a few thick layers, as they allow you to more easily add or remove layers to find that "just right" combination. FWIW, on the uphills I generally found that I was comfortable with just a base layer and a shell layer, but breaks for lunch as well as the descents, insulating layers definitely proved their worth. Clothing accessories that will allow you to maximize your warmth in the worst conditions. Ski goggles and a balaclava/face mask will completely insulate your head from the cold. And mittens are warmer than gloves (although you'll still want at least a pair of liner gloves for moments that require dexterity). A solid pair of winter boots. Some hikers claim to be able to weather winter conditions in summer footwear... but they are in the small minority (and I'm somewhat dubious about their claims). Don't skimp on this- find something that is warm and comfortable. Bring extra socks when trying on winter boots as you'll typically have 2 layers of socks on while hiking in winter for added warmth and you'll need the extra space. Make sure your boots have good ankle support- you'll be glad they do when using crampons. Boots with removable liners are really nice for winter camping, but unless they are plastic mountaineering boots (which are wicked expensive and overkill for winter High Peaks ascents generally), these kinds of boots tend to have poor ankle support. Methods of keeping your liquids from turning into solids. Water bottle coozies are imperative, as is a thermos with hot chocolate or coccoa for later in the day. Sugary drink mixes can help prevent drinking water from freezing solid- it tends to turn into slush instead, which can still be consumed. Avoid hydration bladders generally- even with insulation and tricks like blowing the water back into the bladder after each sip, the hose will still freeze solid on cold days. And for that matter- plenty of liquids to consume along the way! Dehydration can be a contributing or compounding factor towards hypothermia and/or frostbite. Calories, calories, and more calories. 4,000 calories a day is not an absurd number when you're climbing multiple High Peaks in the winter. Sugars, proteins, fats, etc.- you'll crave them all. Coat your trail mix with melted butter when your making it. Put butter in your sandwiches. Put butter in your hot chocolate. Gnaw on raw sticks of butter while taking a break on the trail. Keep up a steady intake of calories throughout the day so that you don't crash. And don't forget to eat a solid breakfast for setting out. Headlamps. It's a given that you'll be navigating in the dark, whether in the morning, the evening, or (most likely) both. Some of the more remote High Peaks may even see you just as much time in the dark at the beginning and end of the day combined than you spend in the daylight in the middle of it. A solid headlamp and extra batteries is essential. A backup headlamp isn't the worst idea, either. Mountaineering snowshoes. They do need to be of the mountaineering variety- old fashioned wooden beaver tail snowshoes won't cut it. Mountaineering snowshoes in particular have built in crampons, which are essential (although no substitute for microspikes and crampons when either of the later is needed). Additionally, many mountaineering snowshoes have ascent bars (little bars that you can pop up beneath your heal so that you feet remain level even while ascending an incline). These are by no means essential but many would agree that they are really nice to have. The industry standard for mountaineering snowshoes is the MSR Evo Ascent but there are a number of other descent models/brands out there that work just as well. Regarding the separate flotation tails that you can get for added surface area in particularly deep powder: Some people love them, some people hate them. They do offset your center of gravity from the surface area of the snowshoe a bit- this can take some getting used to in any case. Microspikes. You're going to encounter thin, glare ice on exposed rock where even the built in crampons on your showshoes won't suffice. For these stretches of trail, Microspikes have become standard (and they've largely replaced instep crampons which you never see anyone using anymore). Make sure you actually have Microspikes and not a knockoff- and that you especially don't have Yaktrax, which are largely useless and poorly designed. Crampons (not essential immediately but you'll need them sooner or later). I personally found that I needed crampons on about 10% of my hikes while working on the Winter 46. So the need for crampons is not tremendous and Microspikes will usually suffice- but if you're serious about becoming a Winter 46er, then sooner or later you will encounter a stretch of ice where neither the builtin crampons on your snowshoes nor your Microspikes will be sufficient. Ice climbing crampons are overkill, and I agree that 10 point crampons will suffice. Super Important: Not all crampons are designed to work with all kinds of boots! Technical mountaineering and ice climbing crampons are designed to be used only with rigid mountaineering boots with a steel shank in the sole and plastic welts on the heel and toe of the boot. These models are often referred to as "clip" crampons, as they clip (or snap) onto the plastic boot similar to how downhill ski bindings work, with straps as a backup. Crampons designed to work with any kind of boot are often referred to as "strap" crampons as you just strap them on with the webbing attached to the crampon. Black Diamond's Contact Strap is a good entry level crampon that should get you through just about any on trail conditions that warrant crampons in the High Peaks. (I cringe whenever I see winter hikers in the High Peaks with crampons that aren't designed to be used with their footwear- this can be pretty dangerous, as the crampon can pop off your boot without warning, leaving you in a sketchy situation without any traction whatsoever.) One final comment concerning crampons: It's pretty much a given that you're going to put some holes in your gaitors/snowpants until you get the hang of using crampons. Ice Axe (optional). With the possible exception of the Saddleback Cliffs (which can be avoided), it's fairly unlikely that you'll ever need an ice axe for anything on-trail in the High Peaks. An ice axe can nevertheless be useful- and even I'll admit, it does feel really cool to own and carry one. If you do purchase one, please put the effort into making sure you select the right size for your height, and that you also put some effort into learning out to properly use it. Appropriate use of an ice axe isn't exactly rocket science, but without some training using one, an ice axe can actually elevate the level of danger you're exposed to. And in the off chance that you ever need to actually self-arrest (not particularly likely on trail but nevertheless possible in a few spots), some level of practice in doing this can make a substantial difference in whether you're successful or not. Trekking poles with snowshoe baskets (optional but strongly recommended). These are really nice to have for balance, especially while glissading down snow-covered trails. Make sure they have the snowshoe baskets! Trekking poles with just the summer mud baskets are largely useless in deep snow (they'll sink down impossibly deep and you'll get thrown off balance). You can purchase snowshoe baskets for Leki brand poles at places like EMS. Extra webbing. Between your snowshoes, crampons, microspikes, trekking poles, possibly an ice axe, etc., you're going to at times have a bunch of stuffed strapped to the outside of your pack. Webbing will be super handy at ensuring that everything is well secured. Avoid rope unless you really know what you're doing. Rope is sort of like ice axes but even more so- trying to use it without the knowledge of how to appropriately and safely do so can easily put you at a greater level of risk than not having any rope at all. These means knowledge of anchors, belaying, knots, etc. The above is by no means an exhaustive list, and I've kept it relatively general as opposed to specific. If you search through my old posts, you can find my gear list of what I carried while working on the Winter 46, and that list may prove useful to you. If you're looking for additional info, the authoritative text on winter mountaineering is Mountaineering: The Freedom of the Hills. Much of this book admittedly delves into advanced topics that go far above and beyond anything you'll need to use for the Winter 46 (and I'll add the caveat that reading this book doesn't by any means make you an expert in any of those advanced skills), but the first few sections are still chock full of essential information about general winter mountain climbing gear that is still useful to anyone who was serious about tackling the High Peaks in winter. Remember that some of the High Peaks have longer approaches in winter than in summer due to seasonal road closures. Parking for the Dix Range from the south in winter is at Clear Pond, not Elk lake, which adds 4 miles round trip to any hikes undertaken from this trailhead. And Coreys Road usually isn't plowed beyond Axton Landing or Stony Creek, which adds 8 miles round trip to any hikes in the Seward Range. I'd also put some effort into vehicle preparedness as well, especially given that some of the High Peaks trailheads are pretty remote in and of themselves. Coming out of the woods at the end of the day to a car with a dead battery at a remote trailhead can be just as much of an "oh crap" moment as an injury in the backcountry. Have your car battery checked, keep ice scrapers and a broom in your car for cleaning off snow and ice, keep a set of tow straps in your trunk (if you go off the road you might be able to just flag down the first truck to pull you out regardless of whether they have straps or not), make sure you have snow tires on your vehicle, keep extra warm and dry clothing (and maybe even a couple of sleeping bags) in your trunk, get tire chains if they can be used on your vehicle (and check on this first before buying/using them), have a hide-a-key somewhere on the exterior of your vehicle, etc. Again, Winter Backpacking for beginners alone, without the added challenge of a High Peaks ascent, is a beast of a challenge that is substantial in its own right. You'd be wise to undertake your first 1 or 2 winter overnights without any expectation of being able to summit a High Peak. A durable tent that is double-walled and vents well. Note that I did not say a "4-season tent." I'm of the opinion that while it's not necessarily a bad idea to carry a 4-season tent in the Adirondacks in winter, they are usually actually overkill (and wasted weight to some extent) for the demands of the conditions. 4-season tents are designed for foul weather conditions above treeline in true alpine-mountaineering scenarios- and since you can't camp above treeline in the Adirondacks anyways, they aren't essential here. What you do need is a tent that is somewhat durable (can withstand a heavy snow load that falls overnight), with air vents built into the fly (cuts down on condensation inside the tent), that is double walled (helps keep the fly from coming into contact with any gear inside the tent, which is transfer condensation from the fly to the gear some condensation on the fly is inevitable). I call tents that meet this criteria "3.5-season tents" and there's a number available that will function just fine for winter camping in the Adirondacks while also saving you some weight (true 4-season tents tend to be pretty heavy). I will also add that even a tent isn't necessarily essential- I've done a number of winter trips where I used a tarp alone, or some combination of a tarp and bivy sack. Tents are, however, the warmest option by far. A winter sleeping bag rated to -20 degrees Fahrenheit. To be blunt- your 0 degree bags are at best, shoulder season bags appropriate for late Autumn and early Spring. They might work for occasional winter trips if you pick your weekends carefully based on the forecast (and hope and pray that the forecast is accurate) but if you're serious about doing a lot of winter overnights, you're going to be pretty limited by only having 0 degree bags. It's not even December, and the High Peaks region is already this year seeing nights with low temperatures well below zero. A -10 bag might be OK if you're a warm sleeper and/or in combination with a liner, but IMO, -20 is really the standard temperature rating to look for to be assured that you'll be not just safe, but comfortable. Vapor barrier liner (optional for shorter 1-2 night trips, essential for longer 3+ night trips). On longer trips, condensation build up can be an issue in the insulation of your sleeping bag, leading to a noticeable loss in warmth over successive nights. This can be prevented through the use of a vapor barrier liner, which keeps moisture from your body from entering the insulation of your bag and condensing when it comes into contact with colder air surrounding the bag. I will add that the experience of using a vapor barrier liner does take some getting used to- it's best described as "swampy," although you're never anywhere near as wet as it feels. A warm sleeping pad with an r-value of at least 3 (and preferably, at least 4). For years, closed-cell foam ensolite pads were the standard for winter camping, but these offerings are surprisingly not that warm when compared to where recent technology has taken inflatable pads. Thermarest's Prolite Plus (formerly the Prolite 4) is adequate. Thermarests NeoAir XTherm is amazingly warm and light but expensive. Klymit's Insulated Static V is also amazingly warm and inexpensive if you don't mind some extra weight. If you're determined to stick with foam pads, I'd recommend doubling up 2 of them for maximum efficiency. A reliable white gas stove, with at least double the amount of fuel as you would expect to need in summer. Canister stoves become useless when temperatures drop to about freezing, and even canister stoves intended for cold weather use with an inverted canister design become useless when temperatures drop to about zero. Alcohol stoves also lose a lot of efficiency at colder temperatures. White gas stoves are the gold standard of reliability when it comes to winter backpacking in the Adirondacks, as they remain efficient even in temperatures well below zero. The doubling of fuel is necessary if you're melting snow for water, which you almost assuredly will be as liquid water can be hard to find in the backcountry when it's all covered in a thick blanket of snow and ice. With two people, it may even be worth carrying two stoves- this will allow you to cook meals and melt snow concurrently, which will save you on some time. Melting snow especially is a task that is a huge time sink in camp- it takes a really long time (hence why it also consumes so much fuel). Also, if you do find access to running ground water, having the fuel to boil all of it for purification will take the place of filters and chemical treatments, neither of which are reliable in colder temperatures (filters will freeze and crack, and chemical treatments work more slowly and less effectively in colder temperatures). Some sort of method for keeping your liquids from turning into solids overnight. Burying your water bottles in the snow is surprisingly effective and works well- snow is an excellent insulator. Sleeping with your water bottles can be really nice if you start out with hot (almost boiling) water at the beginning of the night. (I personally recommend keeping them in their coozies even if you're sleeping with them so that the heat release is more measured and sustained throughout the night.) Super important: If you are sleeping with your water bottles, be aware that ice in the threads of the cap can cause leaks. I like to fill a bottle with hot (almost boiling water), cap it, then let it sit upright for a few minutes so that the heat will melt any ice in the threads. I then loosen to the cap and reseal the bottle (to make sure that the cap isn't crossthreaded) and then I'll toss it into my sleeping bag. Some sort of method for being able to pee in your sleeping bag (optional). A pee bottle can drastically improve your comfort by helping you to avoid a middle-of-the-night expedition out of your tent to relieve yourself. Being able to pee into a bottle without spilling while in your sleeping bag is as much an art as it is a skill, but it is doable with some practice. Super important: You definitely want your pee bottle to be a distinctly different size and shape from your water bottles, so that you can readily tell the difference between the two by feel without needing to look. You also want your pee bottle to be at least 1.5 liters- 1 liter bottles can overflow after even only 1 or 2 uses. Pulk (optional). A lot of winter backpackers will haul a sled in addition to using a pack to lessen the demands that added weight of winter overnight gear places on your body. Putting together an effective pulk is a little bit more involved than simply using rope to tie a children's sled to your pack (with rope alone the sled will catch up to you and slam into your calves on downhills), but instructions can be readily found and it's not that complex. Another common mistake with pulks is to overload them by putting too much gear in them, to the point that it's less efficient than even a heavily laden pack alone. I personally find that pulks are most effective when use to supplement, rather than replace a pack. The ideal pulk will have about half the weight of your pack (again, this is my experience, and I think there is some subjectivity to this to feel free to experiment with different weight ratios). Something to keep your mind occupied. In the modern age of electricity (and constant entertainment), we don't really perceive just how long and dark the night is. Winter overnights mean spending a lot of time in camp, trying to keep yourself occupied, when you might not be tired enough to sleep. Dinner and camp chores can easily take 3 hours in winter, but if you start at sundown you'll still be finished by 8 pm. Books for singular entertainment, as well as cards or some sort of traveling game for group entertainment, can make the downtime pass by much more quickly and enjoyably when you're not tired. I personally find that I am usually tired enough to fall asleep early on winter backpacking trips, but I often wake up for a few hours during the middle of the night, which I will spend reading. I eventually fall back asleep and then sleep until daylight. A tarp to enclose the front of a lean-to if you're planning on lean-to camping (optional but strongly encouraged). A lot of lean-tos are situated to catch gentle breezes in the summer. Those same gentle breezes can become icy-cold gales in the winter. Having a tarp to close off the front of the lean-to can make a huge difference in comfort. Remember that using nails to secure the tarp isn't permitted, but it's usually not hard to achieve the same objective with some lengths of p-cord. Again, as with the treatise on day hiking in the High Peaks above, the above gear list is not necessarily exhaustive nor definitive. The single best book on the subject of winter backpacking and camping, IMO, is the NOLS Winter Camping text. I'd strongly recommend investing in this one if you're serious about undertaking Winter Camping safely. As I stated above and am re-emphasizing here, expect that all camp chores will take 2-4 times as long in the winter as they do in the summer. Much of this will be due to the demands of addressing the constant battle against the cold. Any actions that require fine dexterity in particular will be a cycle of 10 seconds of exposed fingers followed by 2 minutes of aggressive re-warming of those same fingers by shoving them down your pants and between your legs. Assuming also that you are a male/female couple, the male counterpart will likely need to be prepared for the female counterpart to attempt to take advantage of his core warmth by sticking her fingers beneath his base layers at every available opportunity. Don't expect that you will be able to rely on campfires for added warmth on any regular basis. Obviously, this is a moot point in the Eastern High Peaks were fires are prohibited (and with good reason), but even where they are permitted, it takes a substantial amount of time and effort to start and sustain a fire in the winter, especially if you're adhering to any kind of minimum impact ethic. Most firewood in winter is buried beneath the snow, and much of it is wet, and finding it is a challenge in and of itself. The occasional fire in winter is fine (again where allowed, and when you're willing to put forth the effort to find the legal dead and down stuff), but if your plan for warmth is dependent on a fire on a regular, every day basis, I would argue that you're not adequately prepared for winter camping. It's far more effective and efficient anyways to keep yourself warm through an adequate intake of calories and warm fluids than it is to try and warm yourself by a fire. I think that covers most of the major considerations. Despite the length, this post is really still just an introduction to the topic of winter recreation in the High Peaks. Take the time to consult other sources (again, I definitely recommend the two books I linked). Be careful and cautious and don't push yourself too hard or too fast- the High Peaks will always be there. A single stupid decision on your part in winter, and you might not be around for very long yourself, though. I hope that this post is helpful to you (and others with similar interests who stumble across this thread). I know that I've emphasized safety a lot in what I've written, and I don't mean to suggest that the challenges are insurmountable nor that the experience of becoming a Winter 46er isn't worth pursuing. It can be an amazing and very fulfilling journey, but to ensure the quality of the experience of winter in the High Peaks (much less your personal safety) is going to demand some level of preparation on your part that goes well above and beyond what you're used for summer pursuits. Winter camping and winter peakbagging do not make good bed-fellows. Of course it can be done but you would have to scale back the peakbagging goals in order to accommodate the camping. It depends on what you are prioritizing. The best way to camp would be to use lean-to's and to ensure that EVERYTHING is done the night before. This would include filling nalgenes with hot water and placing them in water bottle cozies inside the sleeping bag. In the morning you wake up, take a long drink, roll out of the sack and go, leaving your overnight gear in the lean-to. Rather than cook a hot meal at the lean-to you either eat snacking food or stop after 30-60 minutes of hiking and boil water for breakfast. It's easiest to camp at one location only and not carry heavy packs up and over the peaks. For example, park at The HPIC Friday, hike to Feldspar lean-to under headlamp, camp, hike Gray, Skylight, Marcy, camp again Saturday and hike out Sunday. Dealing with wet clothing without making a fire is a big challenge. You have to carry lots of extra stuff. Some people use extra-long bags and put their boots in a plastic bag in the foot of their sleeping bag to prevent them from freezing and being impossible to put on. It is possible that the expense of purchasing adequate overnight gear would be close to the same as staying at Tmax 'n' Topo's hostel all through the winter. Hostel owner David is an avid hiker and would be a fountain info on current snow and trail conditions and peak grouping strategies as a function thereof. Yes, DSettahr's post is excellent and encyclopedic. I recommend following his advice. I'm guessing you live in PA or nearby? There are probably some local hills and mountains to practice on. The altitude itself is not the issue; it's the weather, the short daylight, and the rugged terrain. You can probably find these at home, just by choosing to go when things are difficult ( a night bushwhack in a snowstorm can be a tough test, even on a small local hill). Also, when you do want to start camping, test your camping system right in the back yard. Go out and set up just like you were in the wilderness, but if there's a serious problem, you can just go back indoors. As DS mentioned, winter daylight is VERY short. Definitely bring extra lights (they're light and cheap today). Also, you'll find that many people prefer to day hike even the longer peaks for this reason. If you are in camp, by the time you get dressed, fed, and out, and then get fed and back in at night, you have a VERY short day to actually hike (like 6 hours). Also, if you are looking for more advice and opinions, ask over on the sister forum, ADKHighPeaks. ADKForum is broadly focused on many Adirondack pursuits, while ADKHighPeaks is much more focused on the 46. Excellent information and insight, thank you all for posting. As we are likely only up a few times, due to distance, we will choose a suitable weather window and minimize as many risks as possible in line with your postings. Believe us, less about peak bagging and more about slowly (and safely) gathering some skills........to peak bag later...ha ha. Lots of detail and good info here. I'm a day hiker and a saying of mine is "You can never have too many gloves." One pair minimum to get to the top and a great warm pair to get home. I often wear leather x-country ski gloves or even just liners on the climb. Body heat keeps my hands warm enough. But then I always have my best gloves saved for the trip home. I second the recommendation to stay at Tmax & Topos hostel. Or if you want to test out your winter overnight gear in a relatively "safe" environment, you might want to consider staying at the ADK Wilderness Campground at Heart Lake, which is located next to the trail heads for several peaks. They have tent sites and lean-tos. If you choose the Roaring Brook approach to Giant and RPR, there is also the option to stay at the Keene Valley Hostel just down the road. They also allow tenting in their yard. Or there are the primitive tent sites about a half-mile in on the Roaring Brook Trail if you want to try an overnight on the trail without having to carry your gear too far. - Warm hooded puffy jacket (with either down or synthetic insulation) that compresses into your winter day pack. This is not to wear while hiking, but is a key to staying warm while taking a short break (if you take a break at all). - Waterproof shell mittens. These are generally shells that go over your inner glove / mitt layers and add another layer of protection. I find a 3-layer system of liner glove-wool mitt-shell mitt to work quite nicely even in frigid temps. I find that single layer heavy insulated gloves or mitts often cause my hands to sweat, which eventually leads to cold hands or worse. I definitely agree with Don to bring at least a few spare pairs. - Balaclava and face mask; ski goggles. Keeping your face and eyes protected from the wind is essential. Even if the weather forecast looks good, conditions can quickly worsen as you get to higher elevations. - Hot beverages / soup. I always carry a double-wall thermos of hot tea with honey. Others like to bring coffee or cocoa. And while I don't usually take more than a few minutes for a "lunch" break (too cold, etc. ), I do bring a separate container of soup to have as a quick meal. It provides heat, hydration, nutrition and an intangible element of comfort. - Snacks in pockets. Carry high-calorie snacks that will hold up well in freezing weather and are easily carried in your pockets, and can be eaten easily without taking off your gloves. I carry a snack size zip-lock with chunks of pepperoni and cheese cut into small pieces. I also like to carry a mix of nuts and raisins covered in dark chocolate. Keep in mind that many foods that work well in summer don't always translate well into winter. Water, Water, Water!!! It's almost more important to stay hydrated in winter than in summer, since the air is much drier and you won't probably won't feel as thirsty. This means that your body won't "remind" you to drink water, so you'll have to pay attention to how much or how little water you drink. But try not to drink very cold water, as it might reduce your body temperature. As for hike suggestions, I'd add Tabletop and maybe Phelps, depending on the level of ice and need for crampons. Wow, can't believe I did not notice this thread yet. Just a few comments. First, like you I am 6 hours away and usually overnight at least one night when bagging a winter peak. Second, this is just my two cents. It should be discounted to one cent because I have no where near the experience as those that responded above. As mentioned, I highly suggest overnighting at the ADK Loj Wilderness Campground. It gets you very close to many trails and has Lean Tos you can reserve and have to yourself. So you can roll out of bed and get on trail without breaking camp (you can do this in a back woods public lean to but may have other guests arrive). The 'flushies' are nice too. The lower Roaring Brooks site may be interesting because it is close. Yes, our experience is when winter camping everything takes more time. I also personally believe my IQ drops when temps get lower than 15F. Some really basic tasks take longer and I can make some dumb decisions. Best, as mentioned, to pack night before. You'd be amazed at how long I can stare at a knot when it is 5F. I love my SOL breathable bivvy. It extends my 0F sleeping bag down to at least -10F. Also, they compress nicely and go into day pack as emergency shelter. We hike with one each. I have a UV steripen water filter for winter water treatment. I also still carry a small sawyer with my phone on inside of jacket and keep in bag overnight. My 1st aid kit includes chem treatment tablets. We still use our Alky stove in winter. Trangia alky was issued to Swedish military. Yes, you have to carry more fuel and pre-warm it. I do agree white gas is the better choice for winter camping, especially snow melting, but see above mentioned drop in IQ comment. I love the simplicity and we don't melt snow. I am infatuated with primaloft and similar state of the art insulation. My primaloft gloves will get soaked but still keep my hands toasty. I do carry spares. I do want to switch to a liner, mitt, shell idea but will add nitrite gloves as a vapor barrier as some have done. I don't carry extra batteries for my headlamp. I carry an extra headlamp and also a small flashlight. All of this low weight backpacking equipment is small, and when the woods are filled with 24" of fluffy white stuff I want back ups. Start hiking cold. This is especially tough to do starting out after sleeping in the woods all night. But you really do not want to sweat. If you start off warm plan on stopping to adjust. Make sure you have a place to store the layers you are taking off. I can regulated my temps with layers and with hats (no hat, open topped gaiter as hat and cozy winter hat). I often take my gloves off too. Careful what you put between you and camp/car. If you go over Algonquin to get Iroquois you have to cross Algonquin's summit again and conditions might be very different. If you rock hop a creek in the morning that creek will probably be higher in the afternoon after a day of sunshine. Your phone, GPS and other electronic devices may experience faster battery drain in cold weather. Make sure they hike inside your coat and sleep inside your bag. We carry a spare USB battery charger. Do not use GPS as only source of navigation - carry map/compass. We actually each have a set. Do not rush. Take your time. Make good decisions. Turn back or skip a peak if needed. A few starters: Sawteeth is nice, off of AMR Lake Road. Dial & Nippletop as well. Do it so you climb first and have Lake Road as easy out on way home. ... will add nitrite gloves as a vapor barrier as some have done. I've used food-service gloves as vapor-barriers. They're made of polyethylene and are 'one-size-fits-all' (over-sized) to fit any hand. Almost too big but definitely incapable of restricting blood-flow. I'm wearing them in this photo. My seemingly exposed right hand is actually clad in a food-service glove. FWIW, the photo was taken February 11, 2017 atop Iroquois. Conditions were challenging due to very low visibility (< 50 feet) and ice-mist which transformed my clothing into a suit of armor (you'll have to zoom in to see it). Trip report here for the curious. VBL gloves are the greatest invention since the wheel! I have never worn vbl and don’t see a need to start now. People are different. It can get expensive but try things and find what works for YOU. Yeah, if your hand-wear remains dry and your hands stay warm then you probably have no deed for VBL gloves. Personally, I would benefit greatly from a VBL suit. I'm staying at Heart Lake campground around December 27. Did it a few years ago, fantastic! Car camping gear plus snow! If your cold get back into the car and stay safe. Bailed out last year when temps were dropping to -25F last late December. So instead I took my daughter south closer to NYC and we camped out in Hudson Valley at -6f. Amazing what temperature distance 200 miles makes. Oh, I cheat now on some winter trips, picked up a canvas tent and wood burning stove a few years back. And yes, we let the stove burn out before going to sleep for safety reasons. Thank you DSettahr for putting so much efforts in your response. Although it's smaller than "Freedom of The Hills" it still covers the most important aspects of winter hiking and camping. I enjoyed reading it and it was a good refresher for me. Although my winter experience is inferior to Settahr's one (I am still only 15/46W) I still have chutzpah to comment. Ice Axe (optional). With the possible exception of the Saddleback Cliffs (which can be avoided), it's fairly unlikely that you'll ever need an ice axe for anything on-trail in the High Peaks. I did not feel comfortable without an ice axe on icy Macomb slide. I agree that you can bypass it, but sometimes a trail can be broken only over slide and you would not be able to break the other trail to Macomb on your own. I felt more or less OK without an ice axe on Allen slide, but I would have been more comfortable with an ice axe there. Appropriate use of an ice axe isn't exactly rocket science, but without some training using one, an ice axe can actually elevate the level of danger you're exposed to. And in the off chance that you ever need to actually self-arrest (not particularly likely on trail but nevertheless possible in a few spots), some level of practice in doing this can make a substantial difference in whether you're successful or not. I agree, it's not a rocket science. At the same time some practice is rather beneficial, although it's tricky to get in Adirondacks. As a minimum you need to ask your more experienced friend to show some basic tricks and try repeating them. Better option is to get through some winter mountaineering training in North-East. Ultimate option is to get through some real mountaineering training in the West. Study of theory is not sufficient. One of my friends has scary scar (by ice axe) on her forehead ending right between her eyes. She acquired it regardless of rather substantial formal training. Risk of getting wounded is even higher without such training. Camp out in your backyard for 24 hours during a cold winter rain. Dry below zero temps are easy to imagine and prepare for. Just above freezing and rain should be experienced at least once before you are hiking in the rain hoping that it will turn to snow and get colder. Expensive "breathable" rain suits make you wet inside and out, I go for lightweight poncho every time and gators. When is DSettahr's book coming out? I'm staying at Heart Lake campground around December 27. Did it a few years ago, fantastic! Car camping gear plus snow! If your cold get back into the car and stay safe.